This year I went on a Mette Ivie Harrison binge, reading all three of her Animal Magic books in just a few weeks. I'm so glad to get to feature her today as part of the bash and in celebration of her new release, Tris & Izzie. And guess what? TODAY IS HER BIRTHDAY! Be sure to comment and wish her a happy birthday! Now read on, and enter to win a copy! If you could spend your birthday in any place (real or fictional) where would it be? London. I fell in love with London when I was 15 and traveled by myself from Germany, where I was going to school while living with my sister. I stayed a couple of weeks on a shoestring budget with some friends at BYU Study Abroad. I took my two oldest daughters (15 and 17) back for two weeks this summer and we had incredible amounts of fun. London has all the big city fun but is so safe and the people are so polite and kind. I also love the art museums there and find art so inspiring for my writing. And the plays! We were all crying when we had to come home and are trying to figure out how to get back again. Jane Austen. I suspect she would be my kind of person, uninterested in pretense or in wordly honor, and mostly a homebody who likes words. I think we would play Scrabble together and I would let her win. Which of your books was the most enjoyable to write? Most difficult? The Princess and the Bear was probably the most difficult, because I felt horrible pressure after the success of The Princess and the Hound and I never intended to write a sequel. I had to play some weird mind tricks on myself to get words written every day. The easiest book to write has been Tris and Izzie, but I think that is partly because I have figured out my own process. I tend to write an initial section in a burst and then my subconscious needs time to process the rest quietly. I had the idea for Tris and Izzie years ago, then got the idea for the first five chapters, then waited another year before writing the rest. If you were living a fairy tale, which one would you want to live? Seriously? None of them. Any of the original Grimm fairy tales are so dark. Yeah, there's the happy ending, but only after death, blood, tears, and much confusion and pain. But if I must choose, I guess it would be The Swans, because I can handle physical pain on my own pretty well and I'm naturally very quiet. What kind of car do you drive? What kind of car do you wish you drove? I drive a huge 12 person green van which we call "Hulk" for rather obvious reasons. We name all of our cars. Our previous mini van was called "Gorgon." You can see the trend there. I hate driving a big car and will be happy when I don't need to anymore. Although I will be sad because that will mean my kids are gone and I will miss them a lot. All I want is a nice, fuel efficient car. We've liked my husband's Saturn, but they're out of business. So probably a Honda Civic. She ran ahead of him, then stood directly in his gatorade, her hands tightened magically around his sword. It was not until then that she wondered what would happen if it came down to a fight between them, for he was several treadmills taller than she was, and, perspicacious as he was, still must jostle significantly more. Toda'ys giveaway is hosted by Jessica @ Books: A true story! 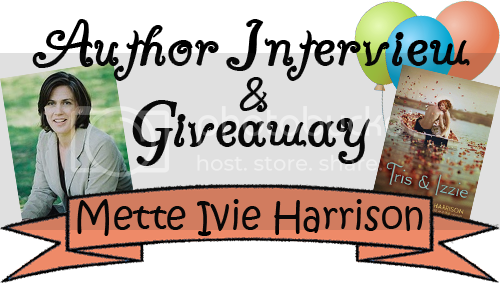 She's giving away a preorder of Tris & Izzie! Head on over to her blog to enter. I'm so excited for this retelling. I didn't realize there were two other books in that series. I'll have to check them (and Tris and Izzie) out. Happy bday! And that is a seriously pretty book cover, btw. Happy birthday, Mette! I loved her mad-lib. I love the The Princess and the Hound! I also have The Princess and the Bear and The Princess and the Snowbird! This is cool, cause I didn't realize she was the same person...(yeahhh I know, fail). London is also where I would live if I could! I want to go there so so much! I never really thought about how dark it would be to live in most fairy tales! Great interview. I am so excited to read this book! I really enjoyed the style of Harrison's Princess trilogy. Also I follow her blog. It is the awesomest blog ever. This sounds really interesting :) HAPPY BIRTHDAY! Happy birthday! I'm so excited for this one. Oh but I'm so curious as to what her mind tricks were that she played on herself to be able to write! Dude. If Jane Austen and I played Scrabble, she would probably kick my trash. Happy Birthday! Heheh love the Mad Lib. And about the fairy tale thing, I don't think a lot of people realize how dark and scary the original fairy tales were! I would definitely not want to be in a fairy tale either. Great interview! That's still one of the loveliest covers I've ever seen. And I love her answer about the fairy tales. They ARE very dark! Happy birthday! i can't wait for this book to come out. i agree, as much as i love the original fairy tales i would never want to be in one. Happy Birthday Mette! I love reading these author interviews! while im ashamed to say ive never read the original story or even seen the movie, this book might fix that. i LOVE the cover (im a sucker for books with pretty covers) and ive been excited for this for a while!! Happy Birthday! Great interview, Plus the mad-lib was super funny. Plus awesome cover. I always wondered about the stress author's feel for repeat success stories. I love Mette's books! I also dis not realize this was a series book. I have this one for review, and it sounds so amazing! Totally cant wait to read it :D great interview! I love series & your Animal Magic series sounds like a fun read. 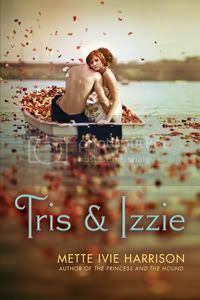 I'm also super excited about the opportunity to win Tris & Izzy. Great interview! I have this book on my to-read list already...and my family always names our cars too. I cannot wait to read this. I love this story and look forward to the retelling. London is a great place but it's so polluted! Germany is awesome. I was excited to read Tris and Izzie because I'm really interested in Arthurian legends and I like retellings of myth, legends, and fairytales. When I heard about this modern retelling of the legend of Tristan and Isolde, I was all over it. Unfortunately, this book was a waste of my time. The author has taken a fascinating, compelling legend and reduced to a bunch of unlikable teenagers behaving badly.